Welcome to Just Tyres Luton. You won't be under any pressure to buy shock absorbers or brakes because we don't sell them! We only supply and fit car, 4x4 and van tyres. This means we offer you expert knowledge and a wide choice of tyre brands. The tyre fitting centre in Luton is located on Windmill Trading Estate, close to amenities and with customer parking available. Just Tyres has been supplying and installing an extensive range of tyres for many years, and our site is designed to provide you with the most suitable products fast. Whether you require a highly comfortable tyre, or something that's perfect for sharp braking performance, you only need to enter your details on our homepage. You will then be presented with a list of relevant results, while you can choose between a delivery or an installation. Our Luton tyre fitting centre is situated on Windmill Trading Estate, and our friendly team can install your items fast, using the very latest technology to ensure safe, professional fitting services every time. 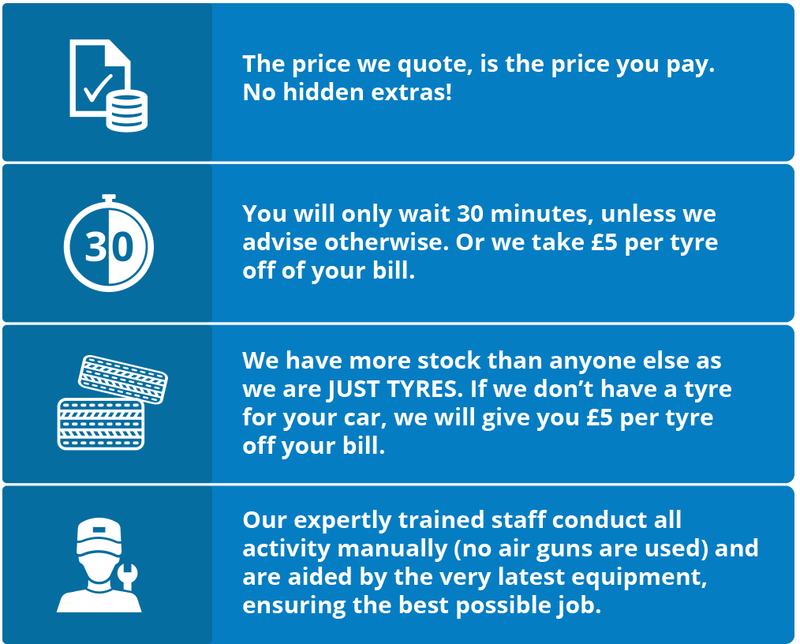 To find out more about our products and services, get in touch with Just Tyres today on 01582 788327. Just Tyres has the skills, the stock and the experience to meet our clients' requirements whether you require delivered tyres in Luton or a professional fitting service. Our brightly lit workshop on Windmill Trading Estate is just one of our many fitting centres, and you can select your preferred appointment date and time when you make your tyre selection on our website. Our products are equipped with a 5 year manufacturer's guarantee, while our price guarantee sees us refund you the difference on a tyre you have found elsewhere at a cheaper price. If you're unsure on the product you require, you only need to get in touch with your nearest workshop and we will be happy to advise you on the ideal solution for your car, and your unique driving style. When you make a search on our website, your results will be split into different categories; cold weather, budget, standard, premium or super-premium, helping you find the ideal product fast. If you have a preferred tyre then you can filter by brand, while your list will automatically be ordered from the lowest price to the highest. To find out more about our broad range of tyres in Luton, get in touch with our team today on 01582 788327.